This ad appeared in the Fall 1990 issue of Sierra News Magazine. I though that was kind of odd given that this does not seem to be a Sierra product but I guess they didn’t have any astronomy related programs that would have competed. 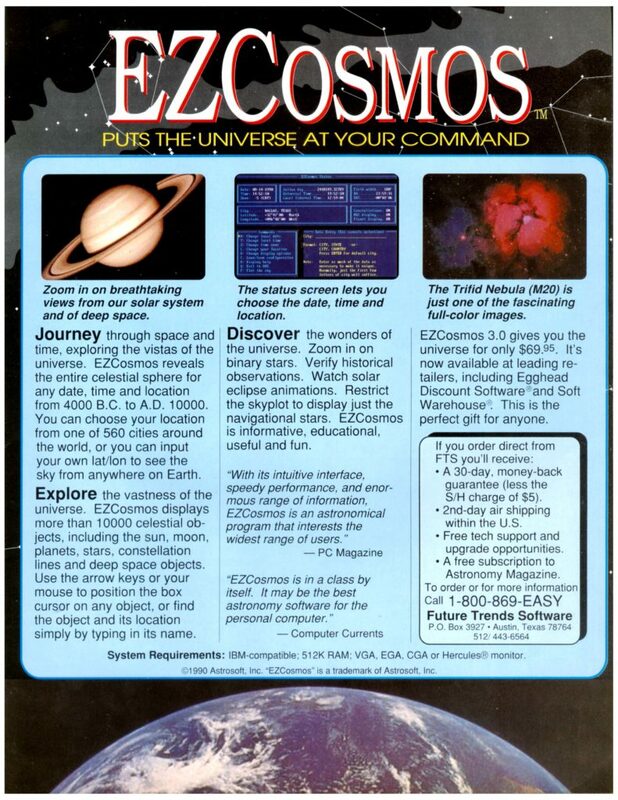 I never used EZCosmos but I used to love the idea of these astronomy programs. It was like having the universe (part of it anyway) inside your computer. As relatively limited as it was, I loved Sky Travel for the Commodore 64. EZCosmos is a DOS program developed by Future Trends Software and there were at least three version. Eventually it was acquired by a company called Software Bisque and incorporated into an astronomy program called TheSky for Windows. This company and software still exists today and is available in several editions for iOS, OSX, Windows, Linux and Raspbian. It has come a long way since its original DOS incarnation. “Journey through space and time, exploring the vistas of the universe. EZCosmos reveals the entire celestial sphere for any date, time and location from 4000 B.C. to A.D. 10000. You can choose your location from one of 560 cities around the world, or you can input your own lat/lon to see the sky from anywhere on Earth. Explore the vastness of the universe. EZCosmos displays more than 10000 celestial objects, including the sun, moon, planets, stars, constellation lines and deep space objects. Use the arrow keys or your mouse to position the box cursor on any object, or find the object and its location simply by typing in its name. 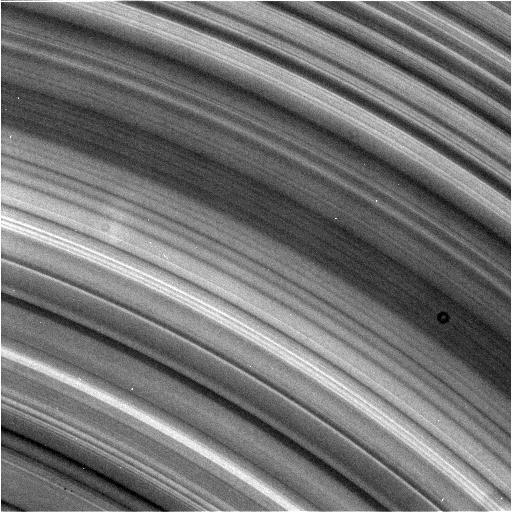 A photo of S Rings, a ring near Saturn. Took by Cassini with COISS on March 07, 2009 at 00:17:12. Detail page on OPUS database. Taken by Cassini with COISS on December 04, 2013 at 02:51:47.